If you are having trouble uploading photos to the Mokes Inc. Gallery and get returned to a blank page, chances are your images are too large. The Gallery software is fairly flexible and will resize slightly oversized images, but anything over 1mb should be manually resized first. Anything too big will simply not upload. 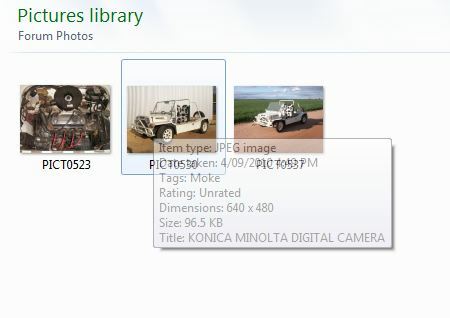 The maximum size for Gallery images is 640x480 pixels, with a file size of 150kb. It doesn't matter what size photo you upload - it will only ever be stored and displayed on the Forum at this size! The closer you can get them to this size before uploading the better. Not only will your photos look sharper and upload faster, but it also stops the Mokes Inc. Forum slowing down - or anyone else sharing the same server. Everyone's computer is different and has different programs installed, so there will never be one simple answer on how to resize your images. However, this is the method I use on a Windows 7 machine with Microsoft Office installed - a fairly average setup. For those of you still enjoying the pleasure of Windows XP, you can download the Microsoft Image Resizer from their site that will do a similar Right Click action to reduce the image size. If none of this seems familiar to you, then a quick google search on resizing photos will bring up plenty of help and alternatives. If you have taken some nice big resolution photos and want to keep them, then you will need to make a copy before resizing them. If you don't, then the original will be resized and the changes can't be undone! Your new smaller photos will take up very little space, so having two copies on your computer isn't a problem. If your photos are just to be used on the forum or you are familiar with using the "Save as" command, then you can skip this step. There are many ways of arranging your photos and folders, so you need to decide what is best for you. I like to keep them sorted in folders according to the subject, and put the resized images in a subfolder. 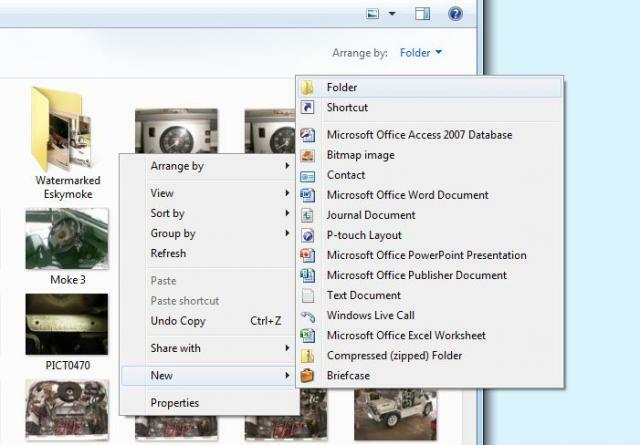 To do this, start by creating a new folder within the folder where your photos are stored. Right click any where in the window and select "New", then "Folder". Now rename the new folder something like "Forum Photos". 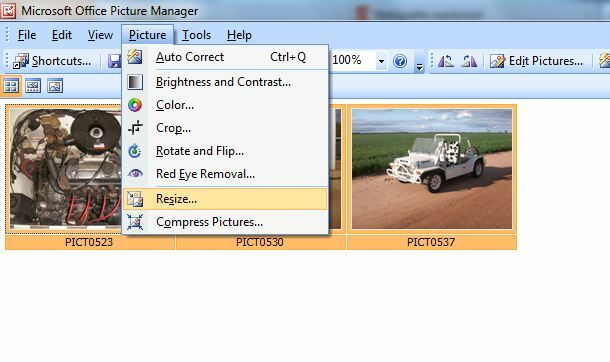 Choose which images you'd like to resize, and using the right mouse button click and drag them to the new folder. When you drop them, you will be given the choice of "Copy here" or "Move here". You want to choose copy. If you use the left mouse button, the images will be moved, and disappear from the original folder. 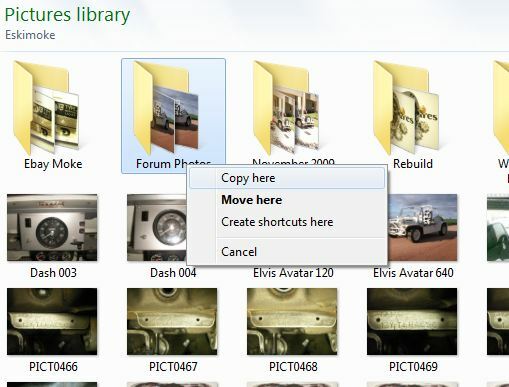 Once you have copied all the photos, open the new folder by double clicking on it. You should see all the photos you copied. Now, on to the resizing! 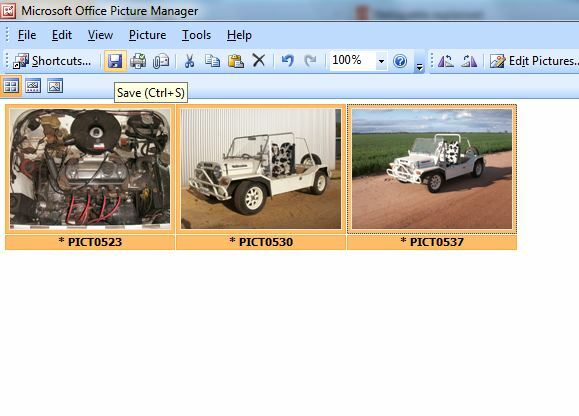 Right click on any of the photos, and move down to "Open with", then move across to "Microsoft Office Picture Manager". 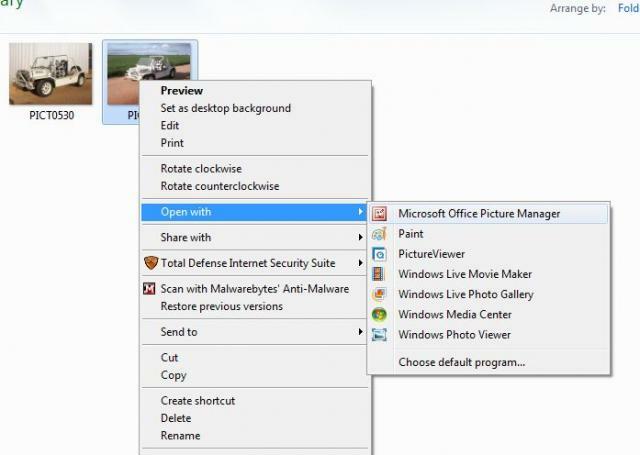 If you don't see this option, you may not have Microsoft Office installed. 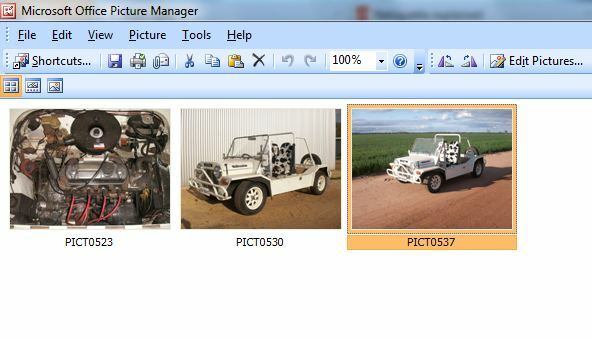 Picture Manager should start, showing your image. If you are resizing more than one photo, you will find it a lot easier to do them all at the same time by clicking on the thumbnail icon on the far left (orange in this picture). Click on the first photo, hold down shift, and click on the last one to select them all. Now looking at the menus on the top line, find "Picture" and click on it. 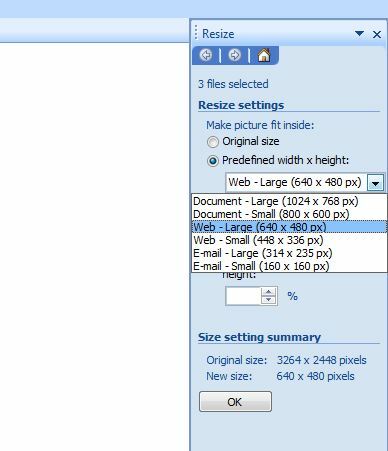 Move down to "Resize" and click on that. Over on the far right a new pane will open, showing your options for resizing. The best choice for the forum is in the predefined width x height list - "Web - Large (640 x 480 px)". Confirm the size is right by looking at the bottom where it says "New size". If says 640 x 480, click OK.
Now you just need to click the "Save" icon to save your changes. If you haven't copied your photos, at this point you can use "Save as" and rename your smaller images to keep your originals. You will need to resize one at a time, and once saved under a different name or folder click "Edit" and "Discard changes", or "Don't save" when exiting Picture Manager. If you check your new folder, you should see all your photos are now resized - hover the mouse over them to check the details. In almost all cases your images will also be below the file size limit, and there is little point in compressing them further. Now they are all neatly stored in their own folder, and ready to be uploaded to the Gallery!